"WITH A SILVER COMB PERFORMED THE OFFICE." And lay me down softly." "Yes," said she, and putting forth her hand, with a silver comb performed the office, placing it upon a primrose bank. Then came up a second and a third head, saying the same as the former, which she complied with, and then pulling out her provisions, ate her dinner. Then said the heads one to another, "What shall we do for this lady who hath used us so kindly?" The first said, I will cause such addition to her beauty as shall charm the most powerful prince in the world." The second said, "I will endow her with such perfume, both in body and breath, as shall far exceed the sweetest flowers." The third said, "My gift shall be none of the least, for, as she is a king's daughter, I'll make her so fortunate that she shall become queen to the greatest prince that reigns." 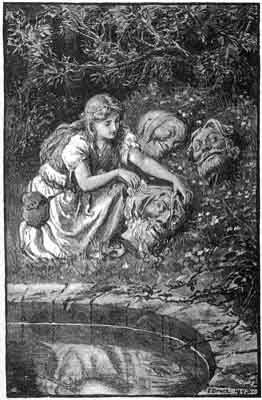 This done, at their request she let them down into the well again, and so proceeded on her journey. She had not travelled long before she saw a king hunting in the park with his nobles. She would have shunned him, but the king, having caught a sight of her, approached, and what with her beauty and perfumed breath, was so powerfully smitten that he was not able to subdue his passion, but proceeded at once to courtship, and after some embraces gained her love, and, bringing her to his palace, caused her to be clothed in the most magnificent manner. This being ended, and the king finding that she was the King of Colchester's daughter, ordered some chariots to be got ready, that he might pay the king a visit. The chariot in which the king and queen rode was adorned with rich ornamental gems of gold. The king, her father, was at first astonished that his daughter had been so fortunate as she was, till the young king made him sensible of all that happened. Great was the joy at court amongst all, with the exception of the queen and her club-footed daughter, who were ready to burst with malice, and envied her happiness; and the greater was their madness because she was now above them all Great rejoicings, with feasting and dancing, continued many days. Then at length, with the dowry her father gave her, they returned home. The hump-backed sister-in-law, perceiving that her sister was so happy in seeking her fortune, would needs do the same; so, disclosing her mind to her mother, all preparations were made, and she was furnished not only with rich apparel, but sugar, almonds, and sweetmeats, in great quantities, and a large bottle of Malaga sack. Thus provided, she went the same road as her sister; and coming near the cave, the old man said, "Young woman, whither so fast?" "What is that to you?" said she. "Then," said he, "what have you in your bag and bottle?" She answered, "Good things, which you shall not be troubled with." "Won't you give me some?" said he. "No, not a bit, nor a drop, unless it would choke you." The old man frowned, saying, "Evil fortune attend thee!" Going on, she came to the hedge, through which she espied a gap, and thought to pass through it; but, going in, the hedge closed, and the thorns ran into her flesh, so that it was with great difficulty that she got out. Being now in a bloody condition, she searched for water to wash herself, and, looking round, she saw the well. She sat down on the brink of it, and one of the heads came up, saying, "Wash me, comb me, and lay me down softly," as before, but she banged it with her bottle, saying, "Take this for your washing." So the second and third heads came up, and met with no better treatment than the first; whereupon the heads consulted among themselves what evils to plague her with for such usage. The first said, "Let her be struck with leprosy in her face." The second, "Let an additional stink be added to her breath." The third bestowed on her for a husband but a poor country cobbler. This done, she goes on till she came to a town, and it being market-day, the people looked at her, and, seeing such a mangy face, all fled but a poor country cobbler, who not long before had mended the shoes of an old hermit, who, having no money, gave him a box of ointment for the cure of the leprosy, and a bottle of spirits for a stinking breath. Now the cobbler, having a mind to do an act of charity, was induced to go up to her and ask her who she was. "I am," said she, "the King of Colchester's daughter-in-law." "Well," said the cobbler, "if I restore you to your natural complexion, and make a sound cure both in face and breath, will you in reward take me for a husband?" "Yes, friend," replied she; "with all my heart!" With this the cobbler applied the remedies, and they worked the effect in a few weeks; after which they were married, and so set forward for the Court at Colchester. When the queen understood she had married nothing but a poor cobbler, she fell into distraction, and hanged herself in wrath. The death of the queen pleased the king, who was glad to be rid of her so soon, and he gave the cobbler a hundred pounds to quit the Court with his lady, and take her to a remote part of the kingdom, where he lived many years mending shoes, his wife spinning thread. 1 From The History of the Four Kings of Canterbury, Colchester, Cornwall, and Cumberland, their Queens and Daughters. Chap-book, Falkirk, 1823.